This Japanese mug from the Turquois Sky and Earthen Tableware Collection is the perfect piece to bring sophistication and modern design to your tea experience, without sacrificing the warm, natural feeling of sipping a hot beverage. This beautiful Asian mug is the perfect balance of a chic shape and interesting texture. It’s made to be a staple among your Japanese tableware collection, and it will certainly stand out. This Japanese Mug features a deep green and turquois exterior that is distinctive for in its charming imperfections and noticeable contrast. Similar to the Small Nesting Bowl and Japanese Sauce Bowl of the same collection, the inside of this gorgeous Japanese Mug is a brilliant, bright turquoise. The wonderful color makes it the perfect mug if you need a pick-me-up cup of coffee or afternoon tea. 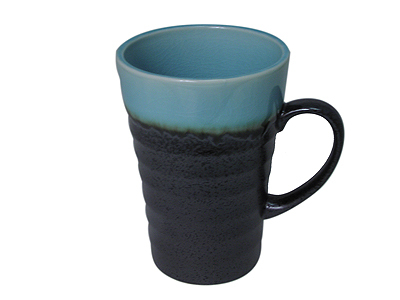 This ceramic mug is the ideal shape and size to have a large cup of green tea or sip on a soothing oolong with dinner. Soon you will be using it every day! Alternatively, give this Japanese Mug as a gift to someone special. It arrives in a paper box from Mrs. Lin’s Kitchen, ready to deliver to a loved one.